During the Xiaomi Days Sale on Flipkart, the affordable Redmi 6 is selling at Rs 7,499 reduced from Rs 7,999 for the 3GB RAM and 32GB storage variant. However, the high- end 3GB RAM and 64GB storage is available for purchase at Rs 8,499 reduced from Rs 8,999. The Redmi 6 features a 12nm MediaTek Helio P22 octa-core SoC, dual rear cameras and full-screen display. Furthermore, Flipkart is also offering up to Rs 8,500 Off in exchange offer where the users have to exchange their old phone with Redmi 6. The Redmi Note 5 Pro had been launched in India in February 2018. Currently the base 4GB RAM and 64GB storage model is available at Rs 12,999 whereas the high- end 6GB RAM and 64GB storage variant is selling at Rs 13,999 after the price cut recently. 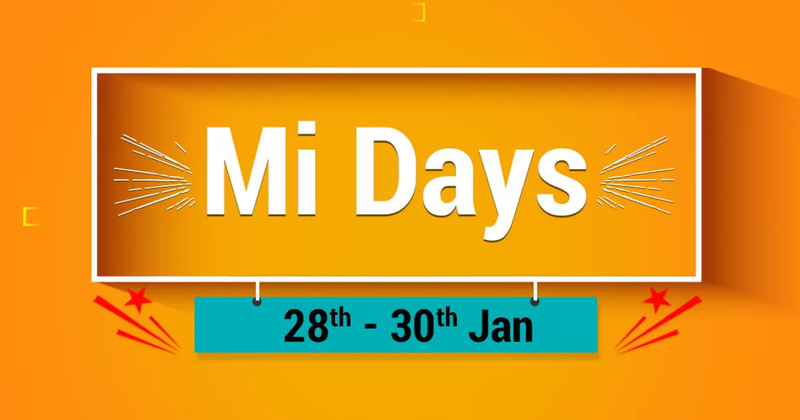 During the Mi Days Sale on Flipkart, the Redmi Note 5 Pro base model will be made available at Rs 10,999 instead of Rs 12,999 while the high- end will be selling at Rs 12,999 rather than Rs 13,999. Flipkart will also be offering up to Rs 12,600 off in exchange offer and no cost EMI options. The Xiaomi Redmi Note 6 Pro is available for purchase at a discounted price of Rs 12,999 (reduced from Rs 13,999) for the base 4GB RAM+64GB storage model. However, the high- end 6GB RAM and 64GB model is selling at Rs 14,999 reduced from Rs 15,999. Additionally, Flipkart will be offering no-cost EMI and exchange offers on purchase of the Redmi Note 6 Pro. The Xiaomi Redmi Note 6 Pro has dual sensors on the front and rear panel, 4,000mAh battery, P2i coating for the water resistance and more. The Xiaomi Poco F1 is the first smartphone under the Poco brand which was officially launched at a starting price of Rs 20,999. Recently, the Poco F1 got a permanent cut of Rs 1000 which brings down the price of Rs 20,999 to Rs 19,999. During the Mi Days Sale, the Poco F1 6GB RAM + 64GB storage model is available for purchase at Rs 18,999. However, the 6GB RAM/ 128GB storage model and 8GB RAM + 256GB storage model are selling at a discounted price of Rs 21,999 and Rs 25,999 respectively. The Xiaomi Poco F1 comes with dual rear cameras, Snapdragon 845 SoC, IR Facial unlock feature and more.